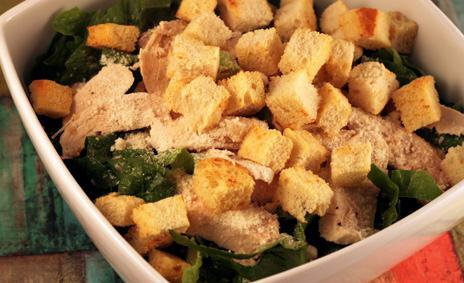 A staple in many chain restaurants across the nation, a good Chicken Caesar Salad recipe is a favorite of so many of us. What draws us in? Is it the grated Parmesan cheese? The creamy dressing? Perhaps it is the garlicky, crunchy croutons. Maybe it’s the combination of flavors and textures. Topped with grilled chicken and it’s more than a salad, it’s a meal. The chicken can be substituted with shrimp or thin sliced steak . 1. Trim bread crusts and discard. Cut bread into 1 inch cubes. 2. Place cubes in a single layer on a baking sheet. Coat cubes with cooking spray; sprinkle with garlic powder; toss well. 3. Bake at 350 degrees F for 15 minutes or until lightly browned and set aside. 4. Coat a large nonstick skillet with cooking spray; place over med-high heat until hot. Add chicken halves; sauté 6 minutes on each side or until well done. 5. Remove chicken from skillet; let cool. Cut chicken across the grain into thin slices; set aside. 6. Combine lemon juice and next 5 ingredients in container of an electric blender. Cover and process until smooth. 7. Add 1/4 cup of the lemon juice mixture to the chicken; toss gently to coat. 8. In a large salad bowl, place the lettuce. Drizzle remaining lemon juice mixture over lettuce and toss well. 9. Add the chicken mixture and cheese, and toss gently to coat. Serve with croutons.